The worst part about a basement flood is not the short-term problem of getting rid of the water. The worst part is the invisible long-term damage that may not be evident right away. Once moisture gets in it leaves behind some horrible side effects like mold and mildew; which can destroy a home from the inside out. Water damage is hard to eradicate without tearing out walls and floors, and there’s no good reason to risk that kind of extensive damage to your home. The best way to ensure that you never face the nightmare scenario of flood damage is to install a sump pump. Adding a sturdy sump pump and large sump pit in your basement is the best way to keep extra water out of your home. If you’ve ever bailed out your basement, or helped a friend or neighbor bail out theirs – and understand that particular misery– it won’t happen with a sump pump. In areas of the GTA that get a lot of precipitation – rising groundwater is a fact of life. When there is extra rain or snow, groundwater is guided through your basement drainage system into the main sewer line in your home, which in turn connects to the main sewer line of the nearest municipality. It all works fine under normal conditions. Problems arise when too much extra groundwater is directed through the drainage system. The main sewer system gets backed up because homes all over town are draining into one central system – and all that water floods right back into the very homes that are trying to get rid of it. The foundation footings and walls need to be free of cracks, holes and voids on the inside and the outside. The waterproof membrane that covers the foundation footings and walls should also be free of defects or breaches. The drainage system, including pipes, weeping tiles, gutters and downspouts should be free of debris and replaced before they wear out. The ground around your home should be sloped at a proper angle that leads water away – not into – your home. 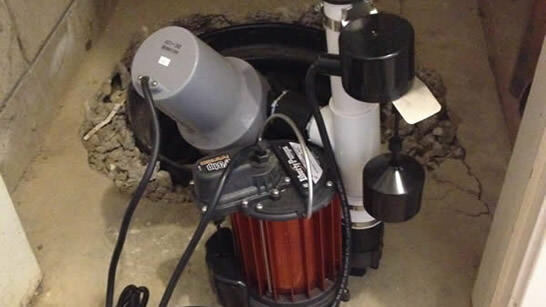 Homeowners in Toronto currently have an exciting incentive to refit their homes with a fully operational sump system. Unlike waterproofing measures, such as landscaping and foundation repair, the sump pit, sump pump and backup battery pump are all fully reimbursable costs. With the recent increased precipitation and flooding, Toronto city planners and engineers concluded that, in addition to the city increasing it’s waste water capacity, homeowners need to do their part by disconnecting their waste water drainage from the municipal sewer system. 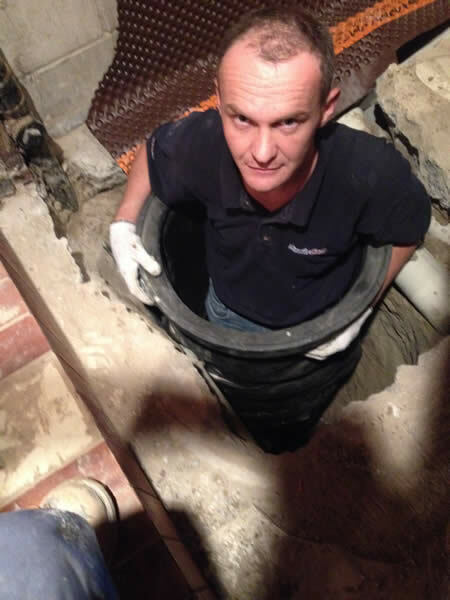 As an acknowledgement of the extra costs involved for private homes to disconnect from the central sewer system, the city of Toronto has agreed to reimburse the full costs to homeowners who install a fully functional sump system and who hire licensed, approved contractors to do the work. Your first question to any contractor you hire to install a sump pump should be whether they participate with the Toronto Flood Subsidy Program. If they do, they should be able to provide you with paperwork to fill out and submit to the city and they should be able to answer all of your questions about reimbursable costs. There’s no longer any reason to put off adding this extra waterproofing measure, especially if the concerns are financial. It is not known how long Toronto will continue to offer this program, so it’s wise to take advantage of it as soon as possible. One of the standard definitions for the word sump is a pit or a hollow in the ground that collects excess water. So, the literal meaning of sump pump is a device that pumps water out of a hole in your basement floor. There is currently no plumbing or wastewater management technology that compares to this ingenious device. Just as water in a dam has to be released periodically to keep the structure from being overwhelmed with water, the water in the ground around your home is constantly putting pressure on your foundation and walls. The pressure is not just around your home, but underneath it as well. In climates that get a lot of precipitation the sump pump is working constantly to keep the extra water from coming inside. Homes in drier climates also need a sump pump for those times when their area gets extra rainfall. The soil in more arid climates is not as dense and absorbent. A sudden heavy rainfall in a dry area will quickly flood homes with rainwater that has nowhere to go. Having a sump pump is critical to avoid disastrous flooding and water damage, no matter how frequent the rainfall. The sump pit gives the groundwater some place to go when the soil is over saturated. The sump pump in the pit monitors the water level and automatically turns on to start pumping the excess water so it’s redirected away from the foundation and basement. Without some means of relieving the constant water pressure, the water will find a way in. The beauty of a sump pump is that it works automatically without human intervention – other than occasional maintenance and repairs. The sump pump is designed to detect abnormally high water levels and spring into action only when needed. What type of pump is the best for my home? How do I know what’s considered a quality brand? The submersible sump pump has a lot of handy features that make it a good choice for almost any home. The submersible gets its name from the design because the motor and its housing sit inside a waterproof casing, which is made of plastic, stainless steel or cast iron. The entire unit sits in the bottom of the sump pit. So when the sump pit is filled with water, the pump is completely submerged. This makes the submersible fairly quiet, as the noisy motor is muffled from being underwater. The submersible comes with a part that operates much like a fan. It’s called an impeller and it provides the suction necessary to move water from the sump pit up through the discharge pipe. The impeller can handle small particles of debris without missing a beat – and without damage to the unit. The other nice feature of the submersible is that doesn’t need an intake pipe, which is needed with a pedestal pump, the water that flows into the pit is sucked right though the pump and into a discharge pipe. Fewer pipes and parts mean less can go wrong. Submersible sump pumps have powerful motors. The standard submersible motor is ½hp and can go up to a hp motor. Because of this they are also more expensive, which can deter some homeowners from the investment. However, the submersible pays for itself over time with less repair and replacement costs. The extra power makes them ideal for homes that are located in flood zones and areas where the ground is flat rather than elevated. The motor on a submersible can take more wear and tear because the motor is kept cool since it operates under water. This allows the submersible to run for long periods of time without overheating. It’s important to keep in mind that submersibles need more room in the sump basin than pedestal pumps because the entire unit operates under water in the sump pit. This is only a problem if your sump pit is less than 2’ in diameter. 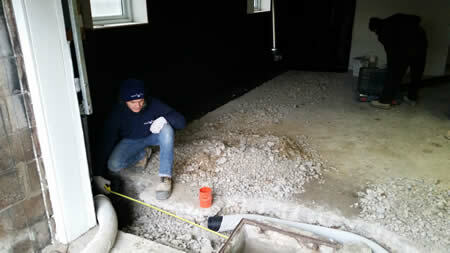 It’s important to keep measurements of the sump pit and the size of the basement in mind when choosing a unit. If you’ve experienced extensive flooding, and you have a lot of square footage to protect – then the more powerful and sturdy submersible sump pump is your best choice. 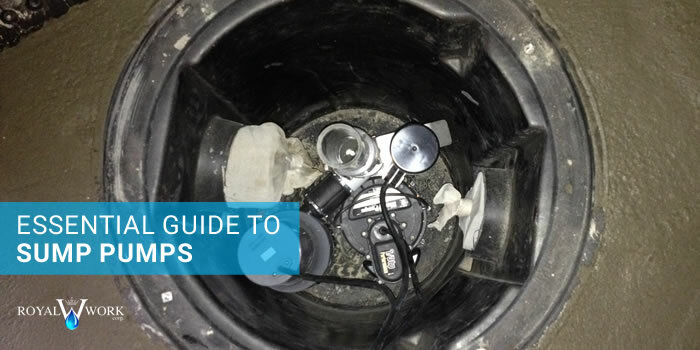 The pedestal sump pump is easier to replace and maintain, but it has some major drawbacks. It’s not as powerful as a submersible. The standard motor on a pedestal is 1/3hp, as opposed to 1/2hp on the submersible. If your home only gets occasional excess groundwater, then a pedestal sump pump will get the job done, although it’s more unwieldy than a submersible. With the pedestal pump the casing and motor are elevated above the sump pit. There’s a float that sits in the sump pit and is attached to the motor with a metal or plastic wire. The wire extends from the motor casing down into the sump pit. When the water level in the pit rises, the sump pump float switch activates the motor, which turns on and starts pumping water up through a hose that’s attached to a discharge pipe that’s also connected to the unit. Problems arise with a pedestal pump because the motor is above the sump pit and has no way to cool down if it’s running constantly. The motor can overheat if it’s overtaxed while trying to pump out more water than it can handle. Additionally, the wire that attaches the flotation device can be rendered inoperable if it gets stuck in one position, which can have devastating consequences if it’s running during a storm. Do you want quiet or loud? The advantages of the pedestal pump include the cost. They are usually half the price of a submersible so replacing them is more budget friendly; although, they usually have to be replaced more often. These days most reputable contractors who specialize in waterproofing recommend the submersible pump. It takes up less room. It’s powerful without making noise, and with regular maintenance won’t have to be replaced as often. It all sounds rather complicated, but it’s not. Done properly, the job of installing a sump pit and pump is pretty straightforward. However, it’s important with this kind of installation to get every detail right. Missing a step could cause the whole system to fail. Understanding the basics of what an installation should include is a helpful first step towards making the right decision about what’s right for your home. It’s a good idea to get a consultation with a reputable contractor who has done these types of installations. Some homeowners may need a new – or expanded – sump pit. 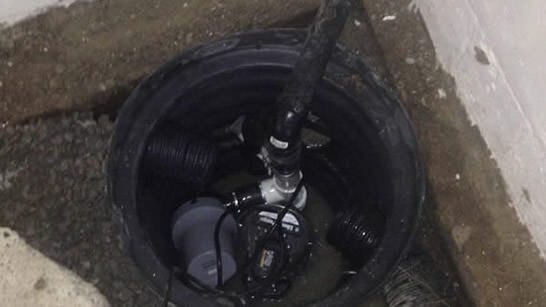 While others may have an adequate sump pit, but need a quality sump pump installed. Additionally, there are times where the pump and pit work well, but a sump pump battery backup is needed for extra protection in areas that experience power outages. You may already have a sump pit in your basement or crawlspace and not even know it. Look around in the corners. It should be located in a corner because that’s where the drainage pipes sit in your foundation footers, and that’s where they feed into the sump pit. A wider, deeper sump pit will fill more slowly than a narrow, shallow basin. Standard size sump pits are usually at least 2’ wide and between 2’ and 3’ deep. 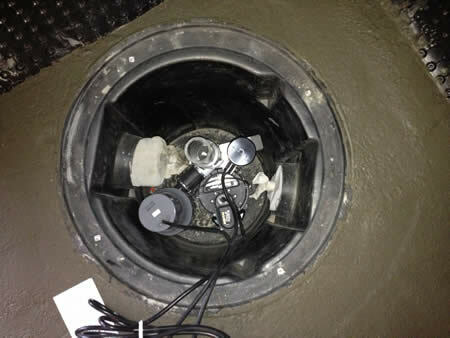 Depending on your needs, a new sump pit can be dug with a larger diameter or an old sump pit can be modified. Whoever digs the sump pit will need to break out the heavy equipment, including the concrete saw and the jackhammer. But before the digging and cutting, it’s important to decide on the volume of water your sump pit can handle. Unless you live in an extremely dry climate – it’s a good idea if your sump pit is at least 24” in diameter. A sump pit this size can hold 14 gallons of water a minute comfortably, without overflowing. You’ll add a sump pump that can handle this volume, but more on selecting the right sump pump later. A sump pit is lined with a large plastic bin that looks similar to a giant garbage can. A hole is cut in the side of the liner to allow the drainage pipes from the foundation to feed into the sump pit. Plastic is best for the liner because it’s easy to make modifications such as cutting holes in the sides for the intake pipes and a hole in the plastic cover for the connection to the outtake pipe. Once the pit is expanded to the right size with a concrete saw and jackhammer, and the excess concrete and dirt removed, the sump liner is placed inside the concrete pit. Gravel is placed in the bottom of the bin under the liner to trap extra dirt and debris in order to allow the sump pump to operate more efficiently. Once the connections to the drainage system are in place and the basin is secure, the area around the plastic basin is backfilled with the extra concrete and dirt from the excavation, and then it’s packed down with a smooth new layer of cement. The right size sump pit is critical to a well functioning sump system. Too small, and the burden of pumping water may overwhelm even the most powerful sump pump. Our contractors go over every detail before installing anything to avoid problems down the road. 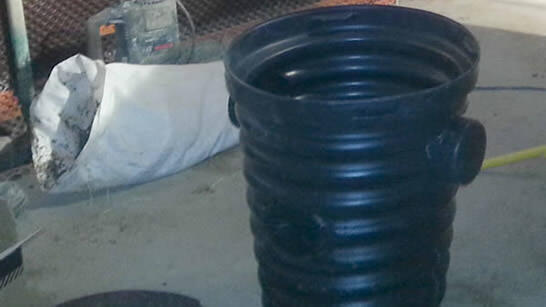 The sump pump needs a PVC pipe connected to its discharge connection in order to direct water out of the sump pit. An additional piece of hardware that is added at the time of installation is the check valve. This valve does the critical job of making sure the water getting pumped out of the pit only travels in one direction – out of the basement. A licensed contractor should install the check valve because an improper installation can render your whole sump system useless. The PVC pipes and check valve are connected to the drainage on the pump before permanent installation to make sure everything fits securely. Once the connections are attached and sealed, the sump pump is lowered into the pit. Once the check valve and PVC is secured to the sump pump, extra PVC pipes may need to be added to for extra height, or completely replaced. Pipes can be cemented together or firmly connected with special clamps that make replacing valves and pipes easier when it comes time for maintenance. Once everything is connected and firmly secured to the pump, the submersible sump pump is lowered into the sump pit, attached to a power source and it’s ready to go! 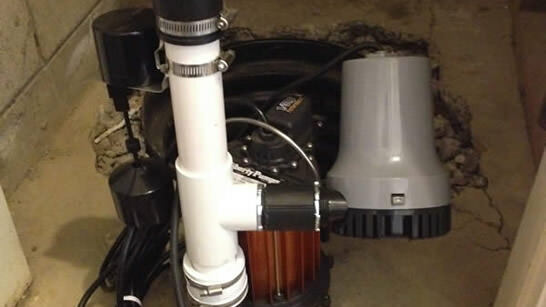 Done right, installing a new sump pit and sump pump will keep your home flood proof. For even more protection, it’s a wise idea to install a backup sump pump that’s attached to a powerful battery. Why would anyone need an extra sump pump? A reputable waterproofing contractor will recommend an additional back up sump pump installed in your sump pit that’s attached to a heavy-duty rechargeable battery. The reason for this is extra protection in the event of a power outage. 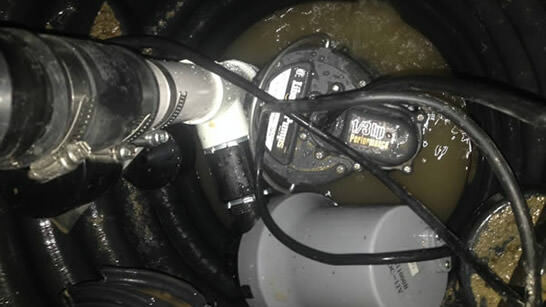 Sump pumps that operate with just a power connection are vulnerable in the event of a storm combined with a power outage. An extra submersible sump pump that runs on a battery is set up to automatically switch on in case the main pump fails for some reason. 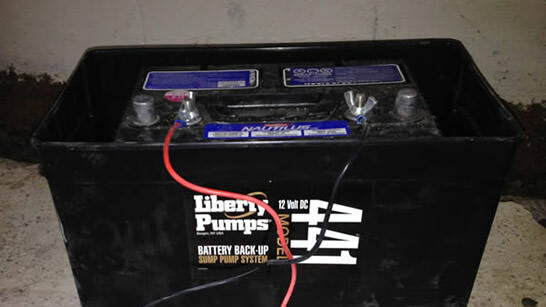 The powerful rechargeable battery that’s connected to the backup pump stays plugged into a power source – once the power goes out, the backup battery can keep the extra sump pump running for at least 30 hours. This is usually enough time for the power to go back on letting the battery recharge again for the next emergency. There’s a decent chance you might not ever need your backup sump pump to kick in and save the day, but spending a few extra bucks is worth the peace of mind. A lot of people don’t realize that the submersible pump has stopped since it’s underwater while the motor is going. There’s no way to know until it’s too late that the primary pump has failed. Who wants to take that chance? Is there really a “best” sump pump brand? It’s natural for experienced waterproofing contractors to have brand loyalty. You just want to watch out for contractors that may have a special interest in selling a certain brand because they have a deal with the manufacturer to sell their products. If they do, they should be upfront about it. Our experts like to go with several reliable sump pump brands. We recommend certain machines because they’re the best choice for our customers, not because we get commissions. We recommend the pumps that run the longest without complications. Every waterproofing contractor has their “go to” brand that they’ve installed in thousands of homes and they assure you will last forever. Waterproofing experts will tell you that they swear by a certain manufacturer or the latest model. The truth is there are many excellent sump pumps to choose from, and if you know how to look for certain things – you can’t go wrong. Plastic, stainless steel or cast iron – does it matter? 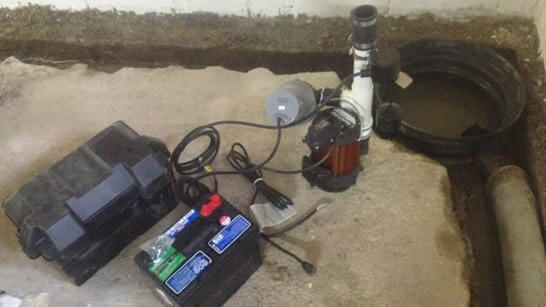 Sump pumps models can come in all plastic, all steel, all cast iron – or a combination of materials. It’s tempting to save a little cash and buy plastic or stainless steel, but because of the kind of hard labor the sump pump will be performing – the full cast iron models will last the longest. Cast iron diffuses heat better than plastic or stainless steel. So if your sump pump is forced to run for a long time during a flood, the cast iron casing will keep the motor from overheating. Sump pump models used to come with the flotation balloon attached to the motor with a thin wire. The balloon stuck out from the side of the pump and when the balloon rose to a certain level, it would switch the motor on. Some models still come with this type of flotation device, but our experts like to go with the newer, and more efficient, models, which carry a vertical flotation device that looks like a small balloon. The floatation balloon on this device is connected securely to the side of the sump pump. As the water rises, the upward movement of the floatation device manually pushes a switch that turns the motor on. This modern switch runs into fewer problems, and rarely gets stuck. When you’re having a sump pump installed; you want to look for the newer, vertical switch. Submersible pumps may, or may not, come with a cover on the bottom that filters out debris. It would seem like having a filter is a no brainer. What’s to stop debris from damaging the pump? In truth, the impeller on the bottom of the submersible does all the heavy lifting. It moves water and small pieces of solid material without any risk to the moving parts. The sump pumps that have a filter cover on the bottom actually run into trouble when the holes in the filter get clogged up. During flood conditions, water and loose debris are moving very fast and the sturdier sump pump models let the impeller do the work. So, it is actually better to select a submersible model that doesn’t have a filter. Does a sump pump need much maintenance? All machines need maintenance, no matter how well built. The importance of a clean, well-maintained sump pump can’t be stressed enough. At least once a year, it’s a good idea to have your sump pump and sump basin checked out by a professional who will catch even the tiniest problems before they affect the operation of the whole machine. You don’t want to skip routine maintenance and risk a sump pump failure during a heavy storm. So now that you know how a sump pump works, how could you not want one? 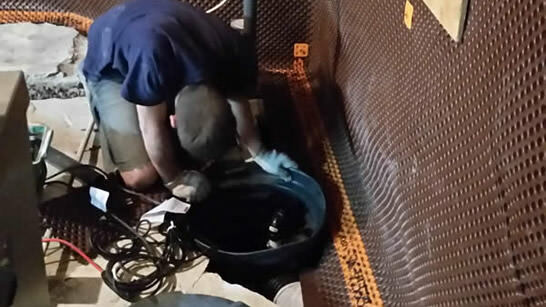 Installing a sump pit and pump is usually a job for a professional waterproofing company as the situation for each homeowner is unique. Even the most knowledgeable homeowner can miss some of the smaller details in a DIY installation. You don’t want to wait until it’s too late to consult with a professional waterproofing company. Professional contractors understand all the specifics of how a sump pump operates, and what type of pump is appropriate in each situation. They also have extensive knowledge of the types of pumps that are best suited for the size of the sump pit and the amount of power needed from the pump’s motor to keep extra water at bay. Their expertise is invaluable. Our waterproofing professionals have worked with thousands of homeowner’s in the GTA to install a high quality sump pump systems. There’s no longer any reason to wait for the perfect storm to take out your basement. Spending a few hundred dollars now can save you thousands in flood damage later on – and those in Toronto won’t need to spend a dime. A free consultation with one of our professionals will help you make the best decision for your home and your budget.